These highly decorative wall posters are informative and interactive. 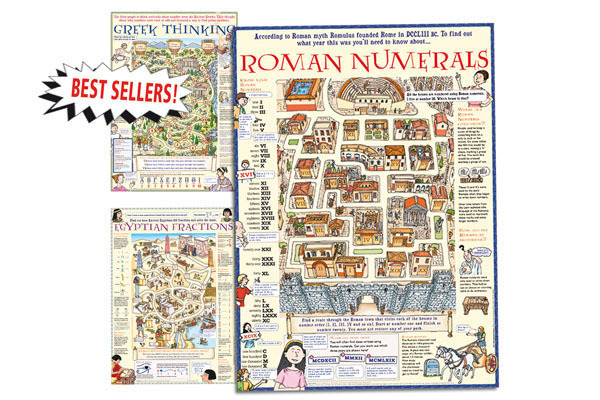 Children can find out about fractions and ancient Egypt, sorting numbers in ancient Greece and learn about the numerals in ancient Rome. They can solve the maze to consolidate their learning. Price includes VAT. 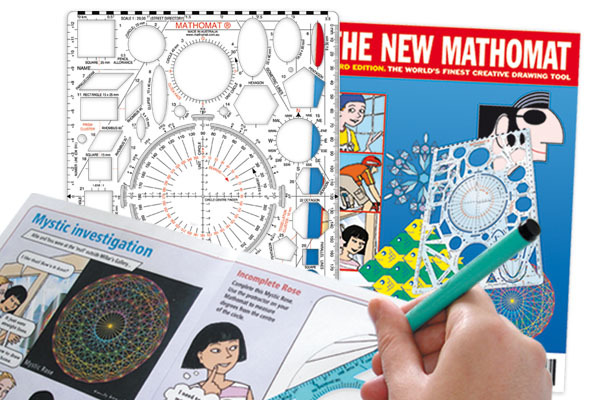 Click here to find out more about WORLD MATHS POSTERS. 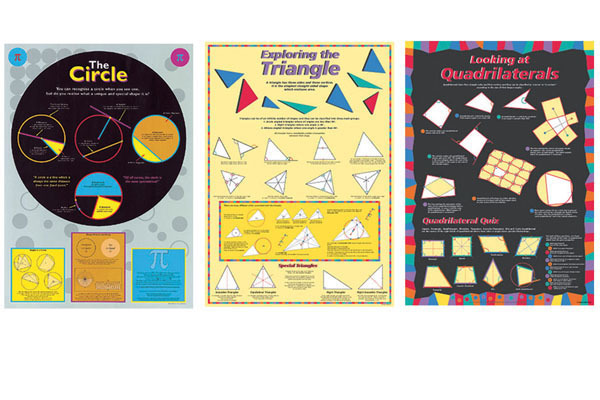 This useful set of posters show in detail the properties of the shapes of circles, triangles and quadrilaterals. Basic facts are reinforced and children will be challenged to explore and investigate. Price includes VAT. Click here to find out more about the EXPLORING SHAPE POSTERS. Based on the games of Snap and Pairs, these simple yet effective cards provide excellent practice and reinforcement of number facts. 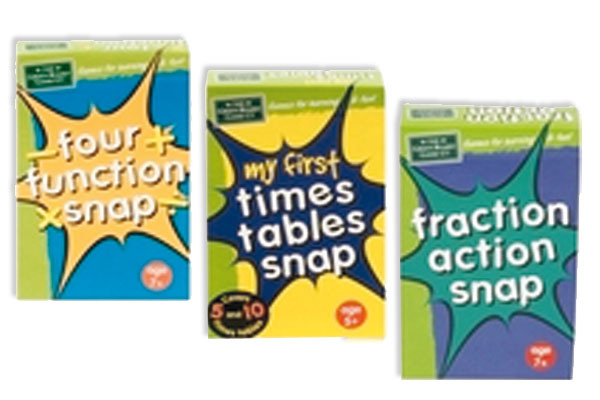 These three packs have number covered: Four Function Snap (operations), Times Tables Snap (tables up to 10) and Fraction Action Snap (match fractions).Use the pop-up menu to choose one or more packs. Price includes VAT. 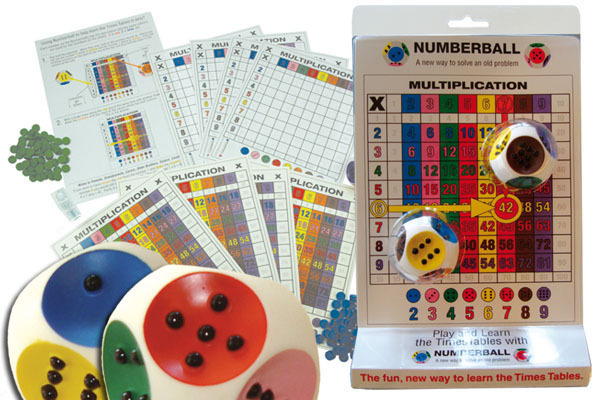 Attractively produced, Numberball is a great aid for learning the times tables. It can be played solo against the supplied timer, or with a group calling out the equations as the two very large (4 cm) tactile eight-sided dice are thrown. A pack comes with two dice, 4 colour cards, 4 blank grids, counters and nifty timer. Price includes VAT. Click here to find out more about NUMBERBALL. Mathomat is a creative drawing tool. This high quality template comes with a thick, full colour combined 'manual' and workbook which includes maths investigations. The topics covered include:using bearings, compass points, angles and polygons, Pythagoras, drawing and constructing solids, symmetry, enlargement and tessellation. Price includes VAT. Click here to find out more about the MATHOMAT. Please note: YOU WILL NEED TO HAVE A MATHOMAT TEMPLATE TO USE THIS BOOK. 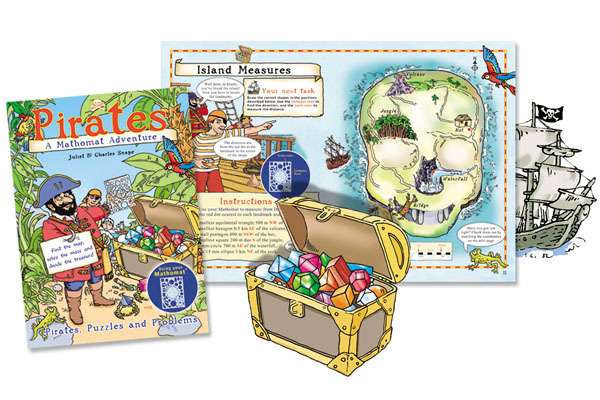 In this full colour workbook join a pirate crew on their quest to find hidden treasure using the Mathomat. To complete the adventure, children will have to: draw and sort shapes, use the protractor and the compass rose to navigate around islands, divide up polygons, measure in scale, design tessellations, solve a shape maze AND MUCH MORE. Ideal for 8 - 11 year olds. 24pp full colour paperback size:195mmx265mm. Click here to find out more about MATHOMAT.